Perugia …and all that Jazz! 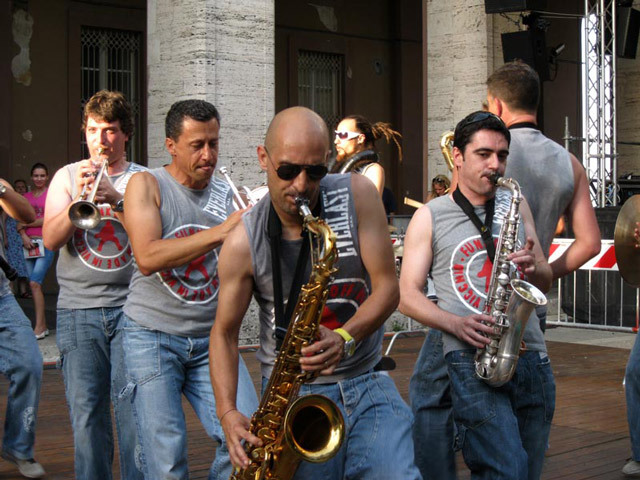 Since 1973, in mid-July the rhythms of jazz, R&B, soul, Gospel, swing, Latino, zydeco, bebop, tango, blues, samba – to mention a few – fill frescoed Perugia theaters, reverberate off the walls of its stately medieval city hall and wrap around the Gothic sculptural masterpiece, the 13th-c fountain, in the main piazza. Yes, things are cooking in Perugia this week giving the city the redoubtable honor of being the hottest city in Italy – but Herbie Hancock, Santana, Prince, Liza Minelli, Gilberto Gil, B.B. King and countless other top musicians – are doing the cookin’…and the rockin’ fans filling the piazzas and streets are feeling a different kind of heat. Over eight-thousand filled the Santa Giuliana arena last night, giving their all to Santana – and mamma mia/wow, he and his group gave it right back, carrying the crowd like a rolling wave – always about to crest – for three hours. Pino and I were there. 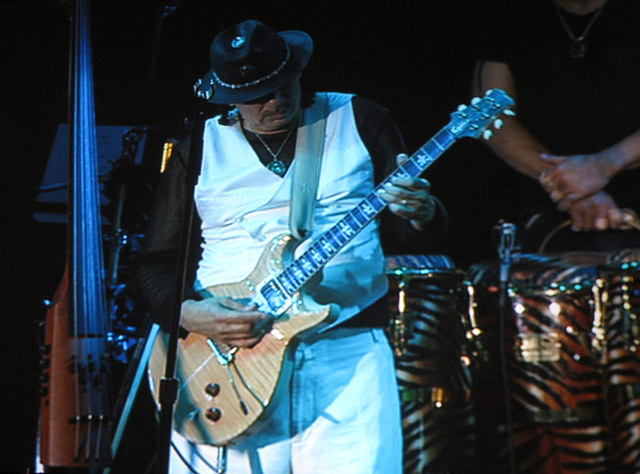 Santana was a protagonist of the San Francisco musical scene during my student years at Santa Clara and then Berkeley so his concert transported me with full force into so many memories. Pino too, though, was carried on the wave as were thousands of other Italians: teens and university students, young professionals, older nostalgics, all singing along and dancing to “Black Magic Woman, “Oye Come Va”, “Maria, Maria”. Carlos Santana knelt at the end, hands folded, head bowed in tribute to his appassionato public. Footnote: I was outside the press room door yesterday at the Hotel Brufani when Carlos Santana was being interviewed. No luck with a photo, though: they spirited him out of the building afterwards via the garage, deluding the waiting fans outside. I would have loved to ask him a question: “Mr. Santana, did you know that in 1973, you caused a young 4th-grader to skip his homework?” That young boy was Trent Miller, son of Steve Miller (Steve Miller Blues Band) and I was student teaching at Rooftop School in San Francisco where he was a student (in the same class, Gio Coppola, son of the director). My turn to collect and review student homework one morning. Trent – an excellent student – had nothing to turn in. To my question of “Why not, Trent?”, he answered, “Miss Robichaud, too much confusion at our house last night – Santana was over jamming with my dad”. I decided his excuse was too good not to be true. 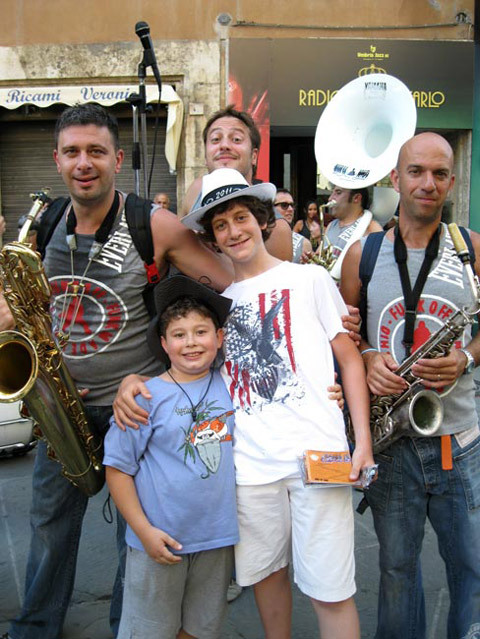 Read about why Umbria Jazz is not to be missed. 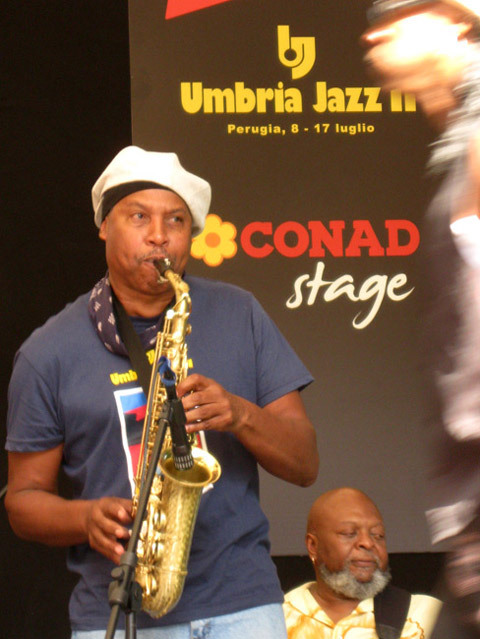 To read about Umbria Jazz Winter in Orvieto, click here. Read more about Umbria Jazz highlights. Wow, looks like a great time! Would love to be there! Oh My!!! what wonderful happenings….and Santana? one of my first loves when I learned about music!! How I would have loved to have been there! am loving all your posts so much….soaking up as much all things Italian, thru you, that I can until I get there in only 1 1/2 months!!!!! We love Italy and we love New Orleans. We love jazz. We want to come to Italy with a small film crew and produce a program. I am developing a series for television. Hope to meet again.